We just returned from Stampin’ Up!’s OnStage Event in Orlando. It was EPIC! Here you can see some of the fun my Stamp It group shared. It was We have so much to share from the event. Including new “Cling Stamps“, and New Craft & Carry Totes. We have sneak peeks at the new products, and find out how 2 frogs made the big time in our video below. Catalogs will ship to customers in mid-December. Join now and get 1 or both of these awesome new Stampin’ Up! Craft & Carry Bags as part of your Demonstrator Kit choices! The Craft & Carry Tote will only be available to Demonstrators, and in a Demo kit. The Stamparatus Bag will be available to customers December 5 (full price). 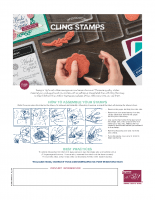 Stampin’ Up!’s red rubber stamps will be better than ever! Beginning in 2019 with the Occasions and Sale-a-Bration catalog, the same quality rubber material you’ve always loved now comes with an adhesive image label that will cling like crazy to clear blocks (AC p. 206) or Stamparatus plates (AC p. 207) every time you use them. The “After Live” Drawing requires a comment on the video to enter. In order to enter, please leave a comment on the Stampin Scoop Episode 68 video on either YouTube or Facebook. If you share the video on Facebook (and type “Shared”) you will receive a 2nd entry. Exciting changes…especially the cling stamp stickers. Can not wait to try the new stamp, and all the goodies. 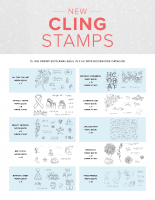 Looking forward to using the new cling stamps. Wonderful bundle sets coming!! Super excited to see the new stamps. Will love the new cling stamps! I am excited about the Classic Garage Bundle! Love the new cling stamps! I am so excited to see the Occasions and Sale-a-bration catalogs.